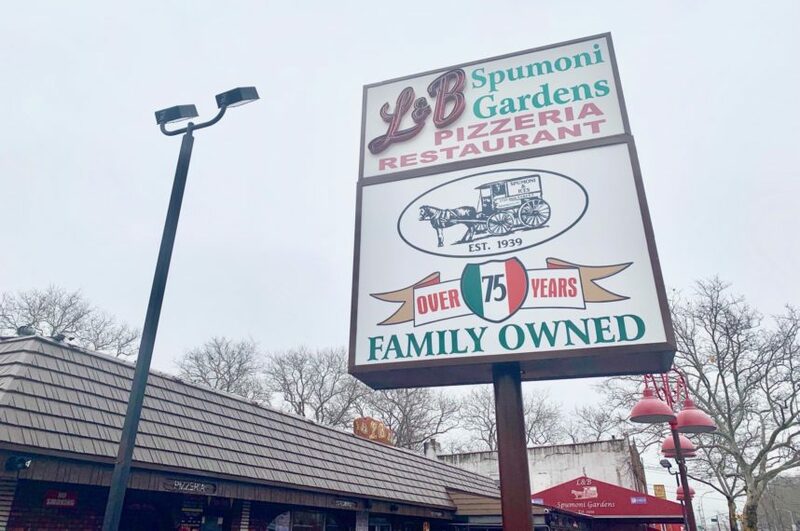 Several friends have told me that they’ve made the trek to L&B Spumoni Gardens in Gravesend, and that it’s not really worth the hype. And you know what? I will never take advice from these people ever again. They have absolutely no idea what they’re talking about. 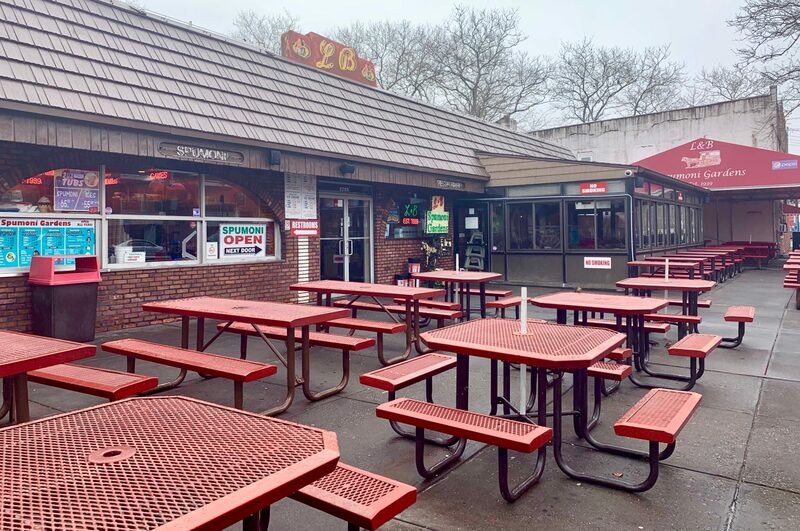 We drove to L&B on a rainy Saturday, parked outside the kitchen’s exhaust fans, and let me tell you, that parking lot smells like my own personal version of heaven. The air is thick with doughy, yeasty, melted-cheesy, tomato-sweet goodness. It’s the kind of aroma that makes you want to drop to your knees and say a little prayer of gratitude for all that is good in this world. But just wait till you taste the pizza. Outside there are lots of tables and lots of signage. It’s the visual equivalent of hanging out with an Italian family that’s always talking over each other, though essentially repeating the same things. Arrows point to spumoni over here, restrooms over there. No smoking sign up high, no smoking sign down low, no smoking sign around the corner, just in case you didn’t notice the first two. Do you know where you are? L&B on the street sign, L&B on the red awning, L&B on the roof, L&B on the front window, twice—once in neon. Welcome to L&B, people, which was established in 1939 (also noted in neon, twice), so they have a lot to tell you and they’ve had a lot of time to decorate. 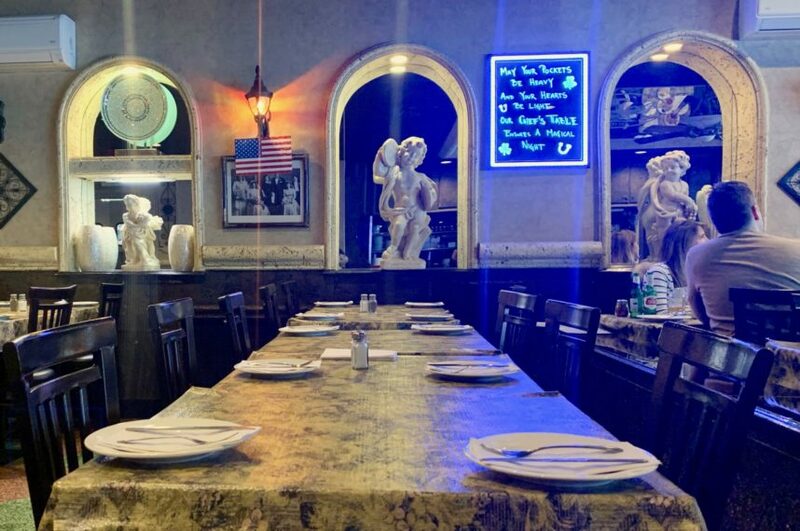 Inside, past the ice cream counter and the slice joint, you’ll find a dining room with a mirrored ceiling and faux-marble arches capping mirrored enclaves where large angel statues hold court. 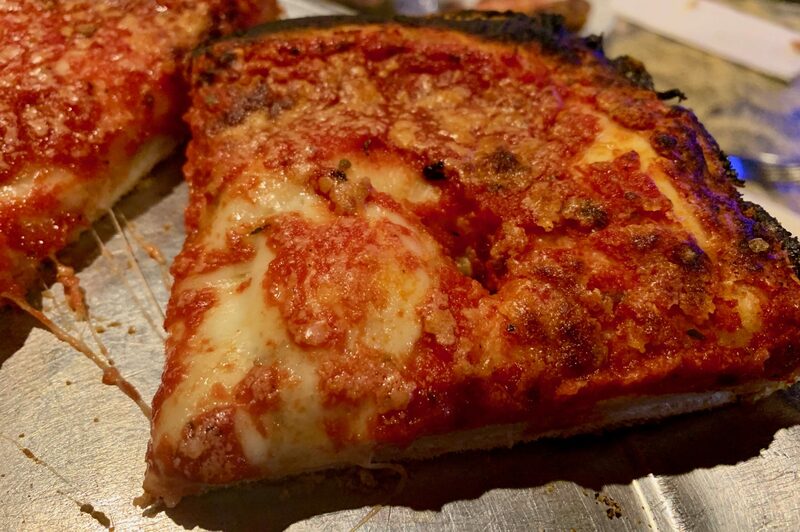 I was pretty sure I could hear the angels singing, but maybe it was just the joy alarms that had been set off inside my Italian-American brain as a waiter slid a sheet pan-sized pizza onto our table. 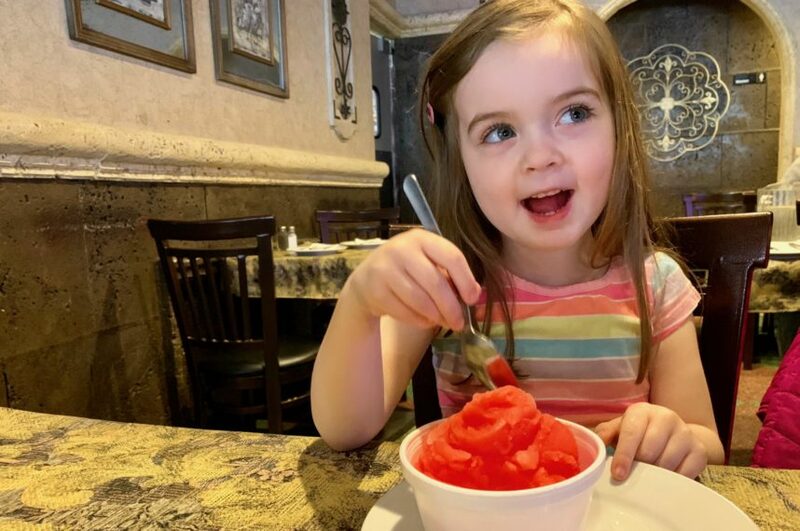 Shortly after making funny faces at the camera, my naughty 4-year-old got dead serious and declared this her new favorite restaurant. I gave her a high five across the table. Okay, so let’s talk about the pizza. 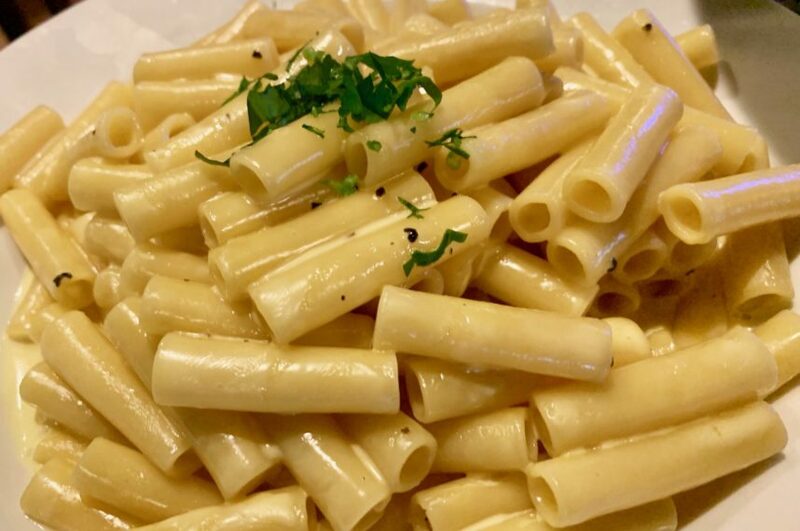 Their specialty is the square-sliced Sicilian pizza, thicker, doughier and chewier than a round pie, with the perfect amount of crunchy char on the bottom and around the outside. 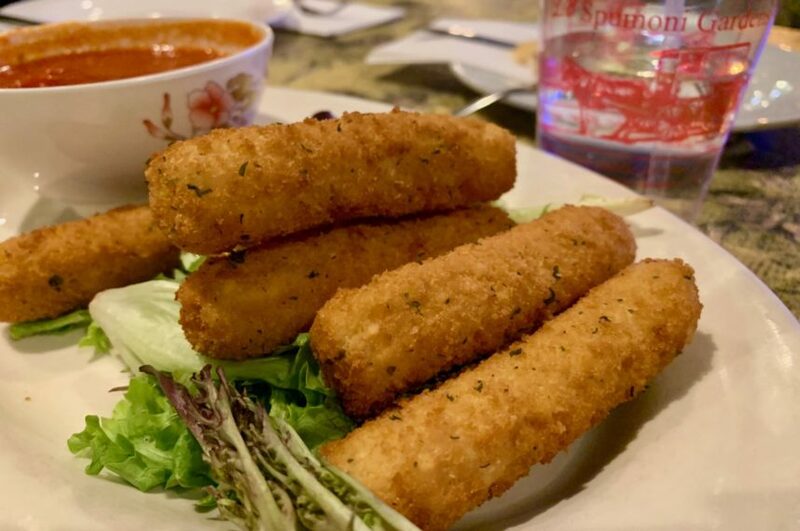 The pizza crust is in direct contact with a layer of mozzarella cheese, which seals in the soft, melt-in-your-mouth quality of the dough, and then it’s slathered with tangy-sweet tomato sauce, a drizzle of olive, a sprinkle of Pecorino-Romano, and mama mia, it sure is delicious. 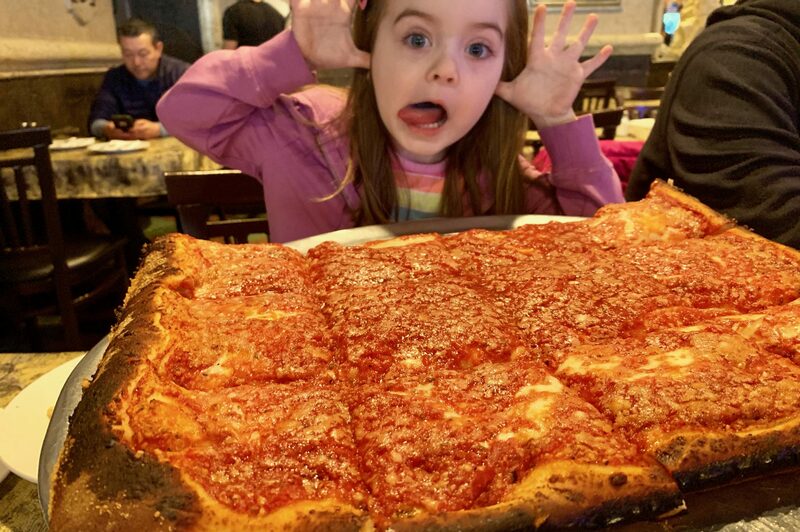 You can get a square slice for $3 or a whole Sicilian pie for $24 (or a round pie for $16, if you must) or you can roll like the family at the table beside us and order a multi-course pizza-free meal and then get a Sicilian pie to go. I mean, some people are just better at life than the rest of us. I was focused on the pizza here, but my tomato sauce-adverse children ordered the mozzarella sticks (to no one’s surprise, they were perfect), and the mac and cheese, which was more of a rigatoni alfredo, the pasta bathing in a pool of perfect cream sauce, which my daughter blissfully sipped with a spoon. At dessert, the kids campaigned for the L&B Dessert Platter, a towering sculpture of multi-flavored ice cream, inverted cones, syrup, and whipped cream, studded bright red maraschino cherries, which had also been served to the brilliant family at the table beside us, but our small party could only handle a cup of vanilla soft serve, a cherry ice, and a cup of the famous spumoni, a nutty and colorful swirl of vanilla, chocolate, and green pistachio ice creams. 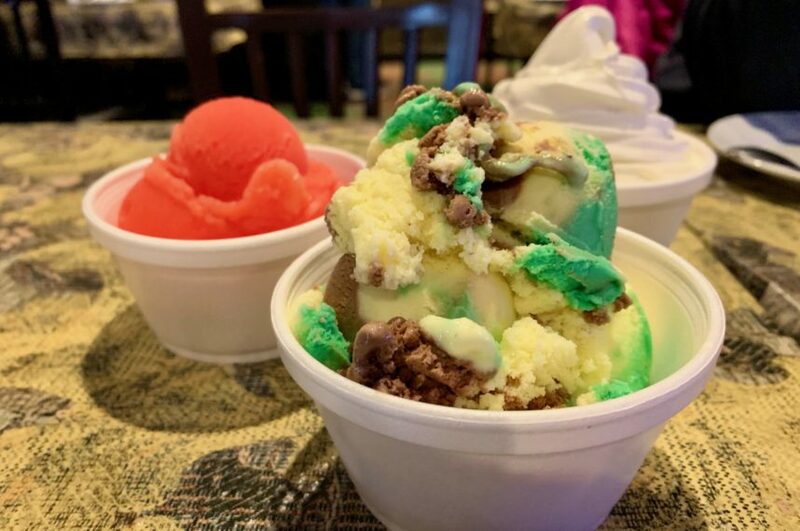 We’ll be back, though, in what I hope becomes a special family tradition as my kids’ appetites expand—one that may someday involve bringing a whole gang of family and friends along and ordering an entire pie for the road. Next PostNext The Global Security News: 8:53 AM 4/17/2019 – None of them should be completely trusted, and all of them should spy on each other. And it is only natural – M.N.